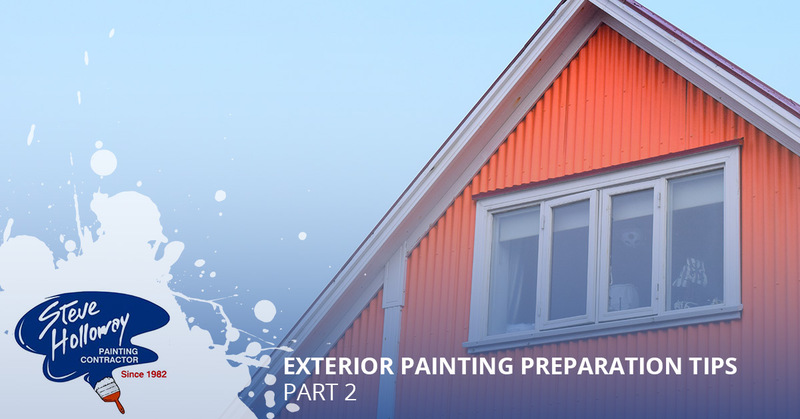 In part one of our two-part series, we briefly discussed a few of the best tips to consider when preparing to paint your home’s exterior. Rushing into such a large project can cause a headache and undue stress for all involved, which is why it is essential to create a game plan beforehand to set yourself up for success. There are many factors that can determine whether your next painting project is completed without any major flaws, and in part two of our multi-part article, we will be highlighting a few more ways that you can ensure that painting the exterior of your home is both easy and enjoyable. As the leading painting service for both commercial and residential areas in Bakersfield, Steve Holloway Painting has provided the highest quality of service and customer satisfaction for more than 35 years. Our commitment to our customers paired with our knowledge of the best painting methods and materials has allowed us to remain as Bakersfield’s highest-rated painting company. Learn about three more tips for preparing your home’s exterior below! Before you begin painting your home, it is essential that you first remove any loose paint, dirt, debris, or dust from your home’s exterior. Failing to do so can cause paint to dry improperly, and can also affect the overall longevity of your paint job. We suggest that your first pressure wash the exterior of your home, as pressure washing can easily scrub away grime and built-up debris that can hinder your exterior painting efforts. If you plan on painting your entire home, there is no reason to paint over old, outdated caulking. Instead, before you start painting the exterior of your home, consider removing any and all caulking that appears worn or damaged. Then, apply new caulking to areas such as the trim of your windows and doorways to prevent moisture and other unwanted elements from entering your home. This will give your home’s exterior a completely updated look and feel that will contribute to the overall aesthetics of a brand new paint job. If you are wanting your exterior paint job to last for many years to come, applying a base coat of primer can significantly improve the longevity of your exterior paint. Primer is designed to work with your paint to provide greater adhesion properties while also working to protect your home’s exterior. The end result is a lasting paint job that is designed to hold up against the elements without quickly fading or becoming damaged. These are just a few of the many tips to consider when it comes time to paint the exterior of your home. However, if you are seeking the most trusted painting professionals in Bakersfield to complete your next exterior painting project with ease, don’t hesitate to get in touch with the experts at Steve Holloway Painting. We provide free project estimates for all prospective customers, and work both diligently and efficiently to ensure that your newly painted home is as beautiful as you had dreamed. Contact us today for more information!